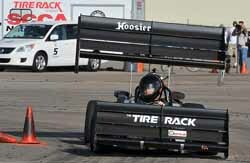 The Wing Shop designs racecar wings for motorsport and track day applications. Production in pre-preg carbon composite is carried out by manufacturing partners DJ Engineering Services Ltd using polished aluminium tooling and autoclave cure to achieve world class results. Our wings are used by some of the top teams in a wide range of competition categories around the world. Dowforce and drag data are available. Please click on Wing data. SM153 - Front wing main element, 275mm chord, for single seater applications in single-, dual- or multi-element applications, designed to operate in ground proximity; can be configured to balance any of the rear wing applications below. 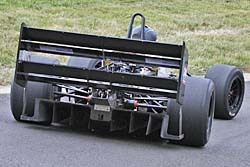 SM183 - Rear wing, 300mm chord, good downforce, low drag, hence very high efficiency (downforce to drag ratio) in single- or dual-element applications. Our original wing design, and still going strong! Specified by well-known luxury road sportscar manufacturers for their 'track' variants but also used in many motorsport applications. SM132 - NEW! Rear wing, 300mm chord, high downforce, very good efficiency; a design targetted primarily at single-element applications, offering greater levels of downforce than the well-known Selig s1223 high downforce profile at similar drag levels. Also very good in dual-element applications. SM203 - Rear wing, 300mm chord, very high downforce for dual- and multi-element applications, in which it requires a strong front-end aero package to obtain an aerodynamic balance! SM101 - 'Flap' profile, 120mm to 170mm chord, to work with any of the above main elements to create dual-, triple- or multi-element configurations. Can also be used as a small chord standalone wing. 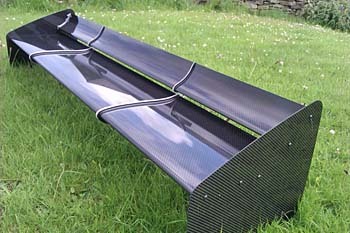 Slat - Leading edge slat for ultra-high downforce multi-element configurations. Spans to 2100mm available (except SM153, 1700mm max.). Various end plate options available from simple 'monolithic' sheet to structural for multi-tier applications. Please contact DJ Engineering Servies Ltd for a price quotation for your specific application and requirements. We believe they offer an unrivalled blend of aerodynamic performance, low weight, structural integrity and aesthetic quality. Check out the successful customers using our products on this page and take a look at the Facts and Figures page. 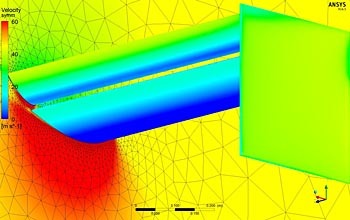 The wing profiles, designed by The Wing Shop's Simon McBeath (author of "Competition Car Aerodynamics" ) have either been evaluated in the MIRA full scale wind tunnel, and/or by computational fluid dynamics (CFD). Analysis of all this information has provided valuable technical support and development data. We have also benefitted from university-based R & D projects. 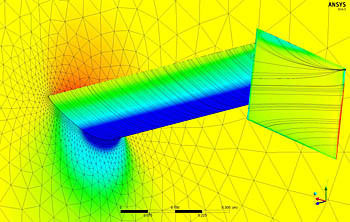 And we are now using ANSYS CFD-Flo software for in-house mapping and development. Need help with your wing selection? Please go to our Advice page or get in touch via our Contacts page, and Simon McBeath, the designer of these wings (and author of Competition Car Aerodynamics, please see Books and Aerobytes in Racecar Engineering, please see Magazines) will be happy to help you with the right wing choice for your car. Free 'whole car' aerodynamics advice! When you order a wing from our manufacturing partner DJ Racecars, Simon McBeath also becomes available for up to a couple of hours of free advice by phone or email on the aerodynamics of the rest of your car, once a payment has been made on your wing. This service is offered to not only help you select the right wing, but to help to ensure that it is deployed on the car as it should be, and that the rest of the car's aerodynamics will allow you to get that all important aerodynamic balance as soon as possible after you hit the track! But do please note that this offer is only available to customers who have made a payment on a wing ordered from DJ Racecars. A more detailed 'whole car' aerodynamics advisory service, known as SMART (SM AeRo Techniques...) is also available - for a surprisingly modest fee. If you want to join the growing band of competitors who have found extra competitiveness by using this service, check out the SMART page. Discounts available to DJ Engineering wing customers. Please browse this page and go to the links on the left to discover more. During a visit to the MIRA full-scale wind tunnel to gather data for my Aerobytes columns in Racecar Engineering magazine in Spring 2013 we invited two very well known UK Time Attack contenders along (whom DJ and I had met when supplying them wings), one of which was the latest and much anticipated offering from Roger Clark Motorsport, 'Gobstopper 2', otherwise known as the latest Subaru Impreza project from this world renowned company, who won the UK Time Attack Pro class in 2008 and 2009 with 'Gobstopper'. Unlike its predecesor the car features an aggressive and well thought through aerodynamics package, with an SM/DJ '203' dual element wing on the rear. RCM directors Matt and Ollie Clark were present to observe and work on the car during the session, and much useful information was gathered. 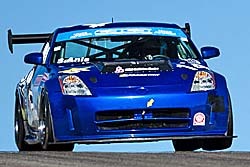 And in 2013 we welcomed Sasha Anis and his gorgeous Nissan 350Z on the Canadian and north eastern USA Time Attack scene into the Wing Shop fold. Sasha runs a dual element SM/DJ 183 wing. Wing Shop wings continue to score outright wins and records on the British Hillclimb scene. Will Hall (Force V6 with DJ-manufactured rear wings), Jos Goodyear (GWR Raptor with Wing Shop designed wing profiles), Alex Summers (DJ Firehawk) and Wallace Menzies (DJ Firestorm) have notched up outright Run Off victories and hill records between them. Look out for more Firehawk and Firestorm successes! 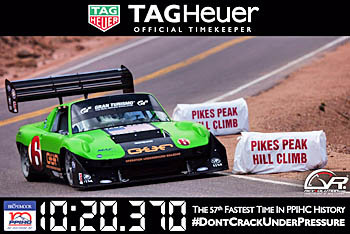 Among cars running our wings at this world-renowned event have been the TRD/TMG electric Radical EVP002 in 2013 and in 2015 Jeff McPherson ran his awesome Porsche 914 with one of our triple element rear wings. Dan Wasdahl from Massillon, Ohio in his BBR Phantom DVS-1 took his sixth A-Mod Championship win with Wing Shop/DJ wings at the SCCA Solo 2 National in 2014, also picking up FTD again. Fred Zust from Tempe, Arizona once again collected the X Prepared class win in 2015 in his Blackwatch Racing Lotus Elise, and Clemens Burger from Noblesville, Indiana took 2nd in B-Modified in 2015 in his LeGrand having won the class in 2009 and 2010. The above drivers were using Wing Shop designed, DJ Racecars manufactured multi-element wing sets front and rear (well Dan was anyway, Fred and Clemens ran our potent dual element rear wing! ), based on our high downforce '203' main element. 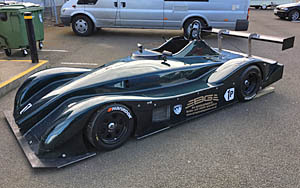 The development of the wings on the BBR Phantom was featured in Racecar Engineering in August 2007 (V17N8), and was carried out by Simon McBeath using CFD, and the support of software supplier Ansys is gratefully acknowledged. And in UK Clubmans, 2015 overall champion Alex Champkin mounted our new 'SM132' wing on his Proto class Vision for 2016. The Wing Shop and DJ Engineering win the 2012 Goodwood Festival of Speed! The 'Top 20 Shootout'-winning Chevron GR8 GT3 V6 driven by Anthony Reid at the 2012 FoS was equipped with a Wing Shop-designed, DJ-manufactured '183' single element high efficiency wing. Reid and the Chevron fended off challenges from an F1 Leyton House CG901B driven by Gary Ward, a Silk Cut Jaguar XJR-8/9 driven by Justin Law, Michael Bartels in a Maserati MC12 and Michael Krumm in a Nissan GT-R GT1. Wing Shop wings and SM AeRo Techniques selected by BBC TV's 'Top Gear' programme! 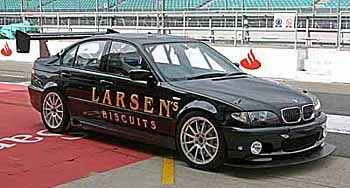 For its assault on the Britcar 24 hour at Silverstone in September 2007, the BBC's Top Gear team contacted the Wing Shop to request a rear wing package to go on the BMW 330D for the event. And the splitter and wing concept came about from associate producer Grant Wardrop's researches in Simon McBeath's book, Competition Car Aerodynamics. The wing kit was delivered and fitted in double quick time by DJ Engineering to meet the incredibly tight timescale of the car build, and the splitter was also installed by DJ. Simon McBeath attended the first test prior to the event to ensure wing tuning data was available and that the package was balanced to The Stig's liking (The Stig is the famous and formerly (!) 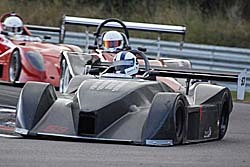 anonymous racing driver on the Top Gear Team). And DJ personnel were in attendance for the duration of the event. Team Top Gear finished third in class (out of five) and 39th overall out of the 60-odd cars that entered. 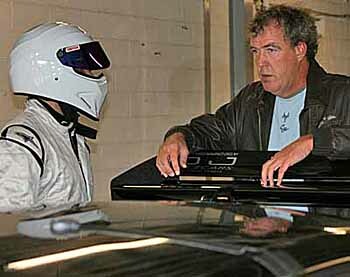 The story was originally broadcast in an excellent edition of Top Gear in October 2007. 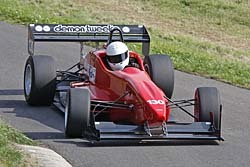 Wing Shop/SM Designs wings have won championships in single seater and sports racing categories as well as finding applications on track day and even road cars. 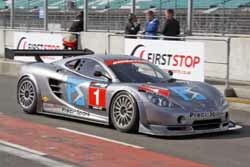 In 2006 the Lotus Cadena Team won the British GT Championship with one of our wings, 2009 British GT champions Precis Spark Ascari chose the Wing Shop for the wing to run in 2010, the Matech Ford team ran one of our wings in 2009 to finish runners up in the FIA GT1 championship. And many other Wing Shop customers can boast of wins and records as well as just plain old performance improvements! Our pre-preg carbon composite aerofoils feature a market leading blend of strength, rigidity, lightness, damage-tolerance and aerodynamic performance, and as such offer excellent value for money. They also look great! So why shop anywhere else? For sales and manufacturing enquiries, please see the Contacts pages and speak to one of our manufacturers to discuss your requirements in more detail. Simon McBeath can also help with advice on wing selection and deployment. Also check out our 'whole car' aerodynamics advisory service, SMART. 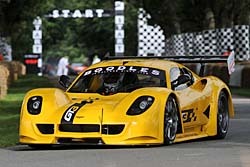 Anthony Reid won the Top 20 Shootout in the Chevron GR8 GT3 at the 2012 Goodwood Festival of Speed. Photo by kind permission of Chevron, taken by ace snapper Jeff Bloxham.